One of the most profound mysteries of life is what mechanism determines fate. When something bad happens, we wonder why misfortune comes our way. When things turn particularly bad, Christians often reach the point where they question God’s motives. It's not just bad luck that makes us reflective. When someone is awarded a large amount of money, we all collectively look at the lucky winner and wonder what caused providence to smile on that person. An atheist would say that fate is all random chance; we are just the product of luck. Because I believe in a divine creator, I know God has a hand in my daily affairs. To unlock the meaning behind events, His involvement must be taken into consideration. It is easy to say that God is in control of all events in our life, but it's hard to determine how involved He actually is in the details. If God were in total control, the decisions we make would not be our own. If God set the universe into motion and then stepped back, the laws of nature and science would be our only guide. There really are no such things as random events. The term "unpredictable" only means that the cause is not known. If we knew all the factors or combinations of factors involved in events, nothing should take us by surprise. With infinite computational power, and taking infinite measurements, it would be possible to predict the future. Some of the most common things in life are so complicated that we can't possibly predict their outcome. For example, we can forecast the general path of a hurricane, but we can't predict it's exact movement. Why? Because there are too many factors involved that change from what they were at the time one makes a prediction until they actually influence the path. The rolling of dice would seem to be a random occurrence, but in truth it is not. Someone throwing dice is in control of all the factors that determine where the numbers will land. We can't tell what will be rolled because he lacks the ability to do the math once the dice leaves our hand. I’m sure a computer will someday be able to instantly calculate "the dice will rotate 123 times in the air before striking that table, and then flip over 12 times before landing on the number five." The plethora of unknown factors in every situation of our lives provides the Lord with an unlimited number of opportunities to supernaturally intercede in our world. The hand of God could move at a thousand different levels in our lives and we would never be any wiser. One of the most basic beliefs of mankind is the idea that everyone should have an equal share of the proverbial pie. In a perfect world, good things would happen to good people and bad things should happen to bad people. We should all have the same status in health, wealth, and social standing. Unfortunately, there is no such thing as an equal world. Our standing in society is largely dictated by the characteristics and circumstances we are given at birth. If someone born into poverty should desire to achieve a higher education, he would have to first overcome huge financial obstacles to achieve his goal. Someone born into wealth would not have this barrier. In many situations, there is no opportunity to overcome obstacles. Someone with a low I.Q. will never be able to advance in the academic field. It seems unfair that someone else with an I.Q. in the genius range has a leg up on all his peers. There would be no controversy if everyone were given a free roll at the dice. The truth is, some folks are given dice with low numbers, while some individuals are given dice with high numbers. One person may have no trouble rolling high numbers when all the faces of the dice have sixes. A person with only ones on his dice would be at a hopeless disadvantage. There is no need for people to be apologists for God. The Lord is extremely blunt about the issue of fairness. He has said, "Therefore God has mercy on whom he wants to have mercy, and he hardens whom he wants to harden" (Rom 9:18). We are told it's not our business to question God's motives. "No, don't say that. Who are you, a mere human being, to criticize God? Should the thing that was created say to the one who made it, 'Why have you made me like this?' When a potter makes jars out of clay, doesn't he have a right to use the same lump of clay to make one jar for decoration and another to throw garbage into?" (Romans 9:20-21). Why Do We Have an Unfair World? It’s important to realize that we live on a planet that is suffering from the effects of sin. All around us, there is disease, death, and sorrow. Some people get cancer and die because their bodies are imperfect. Some may die early in life, but so far, everyone has eventually had a date with death. When you understand that this world has a corrupt nature, it changes your perspective about life, and things begin to make sense. You realize that our stay here is simply a proving ground that prepares us for life in eternity. The only hope we have is Christ, "But because of His great love for us, God, who is rich in mercy, made us alive with Christ even when we were dead in transgressions -- it is by grace you have been saved. And God raised us up with Christ and seated us with him in the heavenly realms in Christ Jesus, in order that in the coming ages he might show the incomparable riches of his grace, expressed in his kindness to us in Christ Jesus" (Ephesians 2:4-7). If you put your faith and trust in Jesus Christ, you don’t need to worry about your lot in this life. God has a wonderful plan to make all the injustices you have experienced in this life right. The Bible records these words about the end of all suffering, "He will wipe every tear from their eyes. There will be no more death or mourning or crying or pain, for the old order of things has passed away" (Revelation 21:4). When geologists excavate the remains of accent civilizations, they often find signs of idols and deities that prehistoric men worshipped. There are actually millions of these gods that people created to fulfill various needs in their lives. They fashioned rain gods to control the weather, and they worshipped the moon and sun because they thought these bodies were temperamental supernatural beings that demanded special attention. Of course, all this idolatry was a waste of time. When a prolonged drought came, the rain god should have been fired, and a search for the true God of weather should have commenced. It should have been obvious that the moon and sun didn’t need man’s adoration to guide their path in the sky. Even today, men turn to idols for help against adversity. Some people think if they only had more money, their plight would change for the better. Others seek after the blessing of luck itself. In the face adversity, they think fortune will for some unknown reason turn in their favor. Proverbs warns, “He who trusts in himself is a fool" (Proverbs 28:26). There is much adversity in America, but I believe firmly that this nation is blessed because it is predominantly a Christian nation. 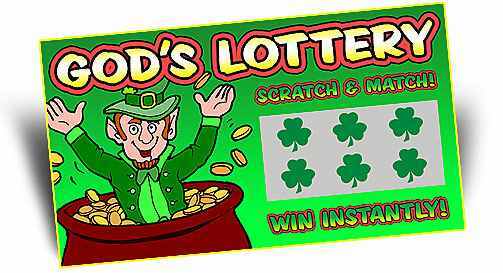 We have no guarantee that the Lord is going to act like a slot machine that pays off every time we praise Him. The lives of many believers have been filled with grief. Even the most casual observer can tell that God has a pattern of taking care of His own. “I was young and now I am old, yet I have never seen the righteous forsaken or their children begging bread” (Psalm 37:25). It is discomforting to learn that life is a lottery, but there is consolation in knowing that God is the one running it. We can take comfort in the wise words of King David, “Do not be afraid or discouraged, for the LORD God, my God, is with you. He will not fail you or forsake you" (1 Chronicles 28:20).